You have a mobile phone with one of the most popular cell phone carriers and you want to spruce up your Verizon phone with a catchy ringtone. There are some great sites out there that offer a broad range of free ringtones to fit your personal style or musical taste. 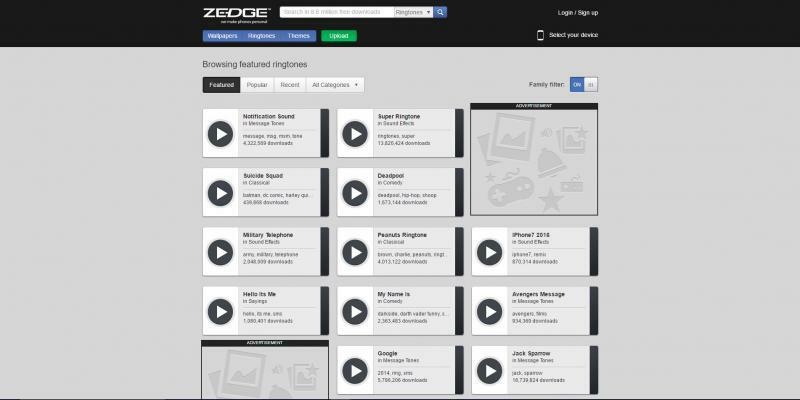 One of the largest and most widely known ringtone sites on the Internet, Zedge has an abundance of ringtones to offer to its users. From music genres like pop, rock, hip hop, dance, and country to sound effects and even sayings, Zedge has it all. Download ringtones either by using your computer to transfer to your mobile device later or get them sent directly to your phone through the mobile app. The app is compatible with Android and Apple devices. Not only does Zedge offer free ringtones, they also provide free HD wallpaper and themes for your mobile device as well. 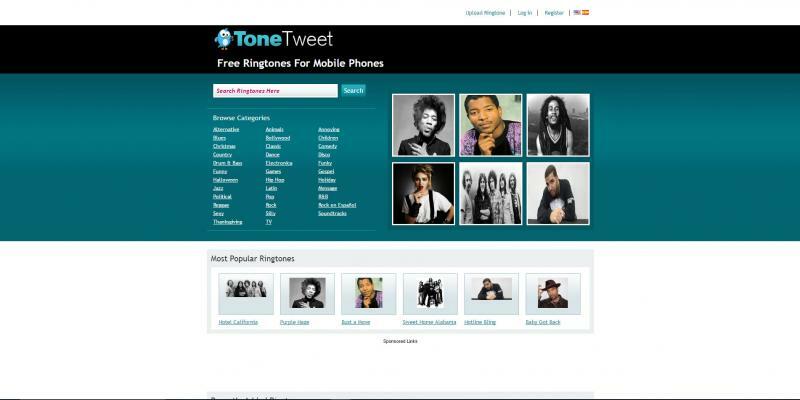 ToneTweet is a simple, straightforward ringtone website that features some of its most popular and most recent ringtones on its front page. They offer just about every music genre there is to fulfill your ringtone needs proficiently. You are not required to create an account to download any ringtone on the site. 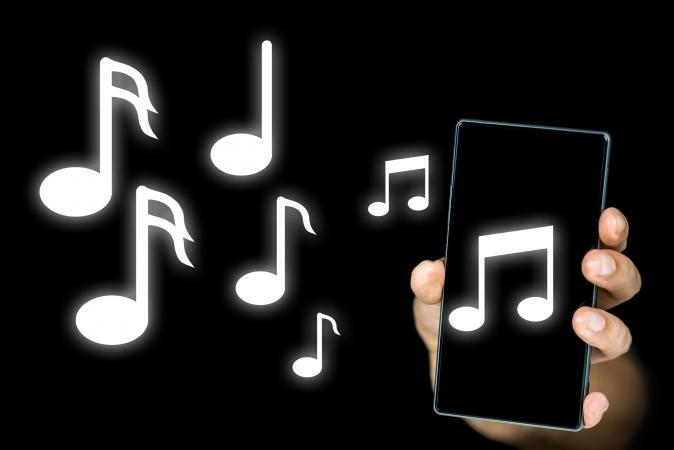 As with Zedge, you can download the ringtone file to your computer and then transfer it to your phone or you can download it directly onto your phone if you have a mobile file manager app like Astro File Manager. Unlike the other sites mentioned so far, mobile9 offers many foreign music genres for users who may be interested in a ringtone in their native language. The catalog includes such languages as Arabic, Bengali, Chinese, Hindi, and Japanese. 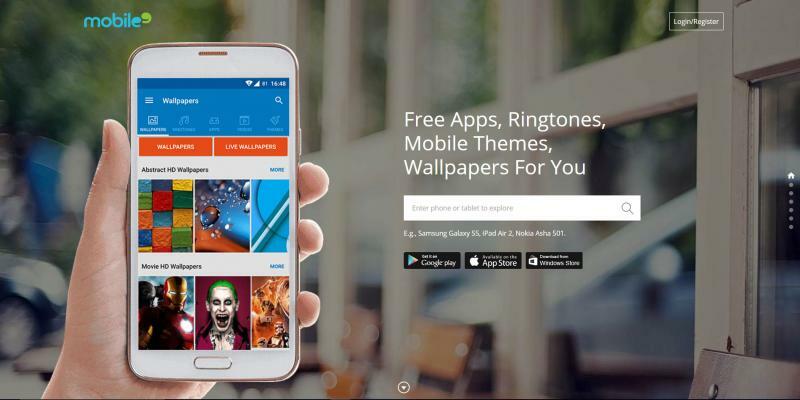 mobile9 has an app for Android devices, iOS devices and Windows devices that users can utilize to download ringtones straight to their mobile phones. 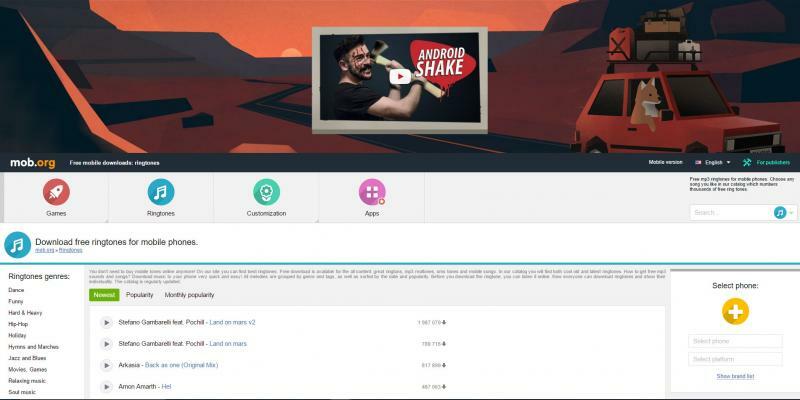 The ringtones offered are filtered by device compatibility, meaning that it only shows and provides ringtones that are compatible with your mobile device. Also, mobile9 offers free HD wallpapers, plus videos from various platforms and sources, for users to download freely too. 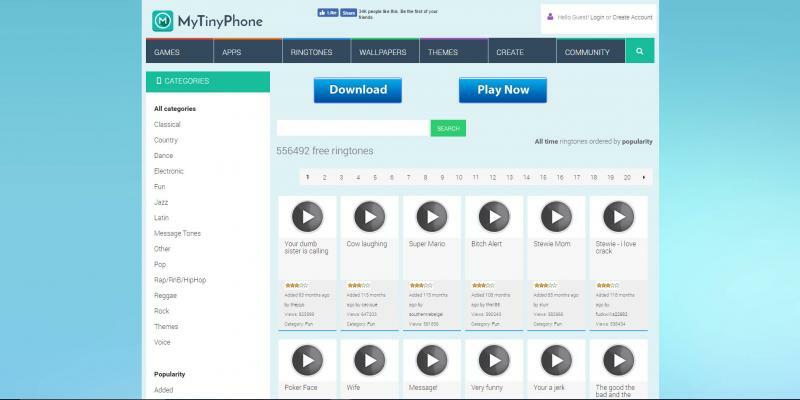 MyTinyPhone offers a vast library of ringtones, many of which are comical in nature with sayings, sound effects, and parody songs. Ringtones are categorized nicely, plus there is a featured section that showcases the most popular or most downloaded ringtones. The site also allows users to create their own ringtones with MP3 files. This feature does however require you to create a free account. For those seeking more, MyTinyPhone also offers HD wallpapers, themes, apps, and mobile games. With popular, trending and chart topping music tones, Cellsea will effectively satiate your desire for fun new ringtones. 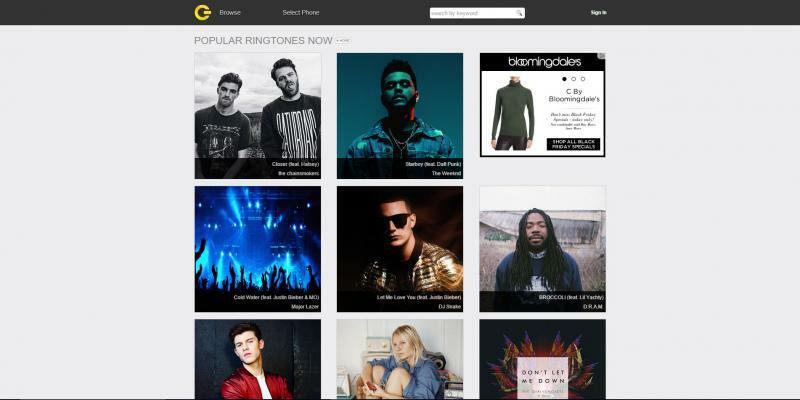 A "Popular Ringtones Now" section on the front page will help to ease your search, minimizing the need to scour for the perfect ringtone. Cellsea allows you to select your cell phone model to filter out the ringtones that are compatible with your specific device. If you have an Android phone, you can download the Cellsea app to create your own custom ringtones too. Filtering ringtones based on release and popularity, mob.org hopes to make searching for ringtones a less complicated and troublesome task. For example, it's easy to sort the listings based on how new the ringtone is, how popular it is overall, and how popular it is this month. You can also utilize these filtering options after choosing a specific genre category. The number of downloads a specific ringtone has received is displayed after each ringtone. Wallpapers, themes, games, and apps are available or users to download to their liking too. A ringtone is like an accessory you wear to help express your personal sense of style. There are numerous types of ringtones to suit your personality, but there are some that may not be appropriate for certain situations. Having explicit music play out loud in a professional setting may draw some unwanted and negative attention. So, be aware of what ringtones you choose and what your surroundings are like.